The University of Montana has emerged as a national and international leader in recognizing the significance of Central and Southwest Asia, and translating that awareness into a major academic program. The program builds on significant faculty experience and expertise in the region, and includes scholars from a variety of academic disciplines. The center has also organized intensive summer language training programs at UM, as well as summer study tours for K-12 teachers to Central Asia, and also hosts an annual conference that brings leading scholars, diplomats, analysts, and journalists to the UM campus. The University of Montana offers an undergraduate major as well as a Minor in Central and Southwest Asian Studies. 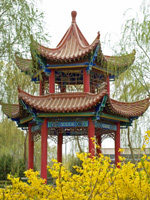 Arabic, Chinese, and Russian language instruction are also offered. Faculty exchanges have been organized with universities in China, Egypt, Georgia, Kazakhstan, Kyrgyzstan, Morocco, Palestine, Russia and Tajikistan.